How do we deal with disagreements in the church? When the combativeness of the political world spills over into the church, what should Christians do? 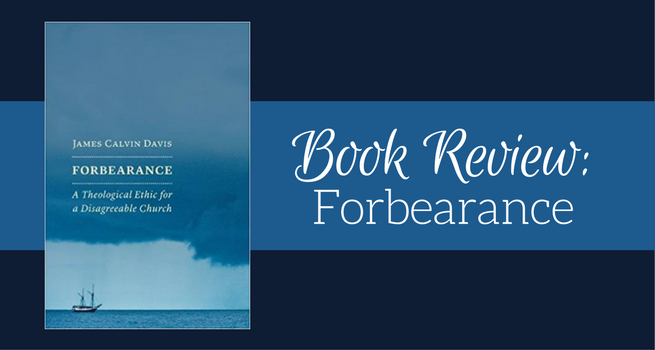 James Calvin Davis’ book, Forbearance: A Theological Ethic for a Disagreeable Church (Eerdmans Publishing Co. 2017), attempts an answer. Davis is a professor of religion at Middlebury College in Vermont and an ordained minister in the Presbyterian Church. A scholar of church and state relations, and a theologian in the Reformed (Calvinist) tradition, he is also the author of In Defense of Civility: How Religion Can Unite America on Seven Moral Issues That Divide Us. While he was raised in an evangelical environment he now identifies as a liberal Protestant. In Colossians the writer exhorts us to “clothe yourselves with compassion, kindness, humility, meekness, and patience. Bear with one another and, if anyone has a complaint against another, forgive each other . . . (Colossians 3:12-13).” The basis of our forbearance with one another is that God extends forbearance to us (Romans 2:2-4). Forbearance, says Davis, is the foundation for God’s grace toward us and is the bedrock of all our Christian belief. Forbearance is defined as “the active commitment to maintain Christian community through disagreement, as an extension of virtue and as a reflection of the unity in Christ that binds the church together.” Davis explores the relation of forbearance to humility, patience and hope, wisdom, faithfulness, friendship, truth, and justice. A final chapter on “Forbearance as Social Witness” rounds out his exposition. A quick glance at three of the chapters may illustrate the practical value of Davis’ book for the church. He examines the tension that many Christian writers claim exists between agape (love) and philia (friendship). Traditionally, theologians tell us that the ideal Christian love is disinterested love, agape, the kind that is inclusive and universal. Friendship (philia) is seen as a rival to agape and even as idolatry, according to Kierkegaard, because it is desire-based rather than duty-bound. But Davis believes that Christian suspicion of friendship comes from an exaggerated emphasis on the story of the Good Samaritan as the exemplar of Christian love. While the love shown by the Samaritan is certainly to be emulated in our relations to the world, Davis points to Jesus’ command to the disciples to love each other. “By specifying love-in-community as the calling card of Christian discipleship, however, Jesus describes something different than the Good Samaritan love of the enemy and stranger. In doing so, he speaks to the importance of mutual affection among the followers of Jesus.” Simply put, community in the church arises from our mutual affection for the people we worship with and develop deep friendships with. Practicing forbearance, the agreement to respect and love one’s fellow believers despite differences, faces its strongest test when those differences are deeply divisive issues such as abortion, economics, race, and climate change. Should the church speak the truth even if it divides the body? Davis appeals to Calvin on what it takes to keep a community together through such disagreements. Christians have to figure out how to live within communities comprising both the elect and hypocrites, as Calvin calls those who participate in the church but do not have a saving relationship with God. We don’t have the option, cautions Calvin, to simply walk away from a church that disappoints us. He argues that “even deep disagreements about theology, morality, and worship are not grounds for division in the church.” In Calvin’s view, not all articles of doctrine are of the same sort: some are foundational and are not up for negotiation while others can be expected to result in disagreement. But what about significant disagreements on the fundamentals of theology and morality within the church? We can’t leave, but neither can we allow such things to fester. Calvin offers three helpful hints. First, we must not fall into the arrogance of insisting that the church reflect our own perceptions of the truth. Second, he asks us to focus on our own imperfections and to avoid exaggerating the impact that others’ convictions may have on us. Finally, Calvin reminds us that “forgiveness is the backbone of the Christian community.” Baptism, our sacrament of forgiveness, is more than a one-time experience; it is the means through which we receive forgiveness continuously—and live with disagreements. Protestants often choose doctrinal purity over a commitment to community. How do we practice forbearance and hold on to our convictions about that which really matters? The secret, says Davis, “to maintaining a commitment to truth while practicing forbearance is to allow the latter to shape the former.” Our deepest convictions are worthless if we cannot live them out in generosity and love. The virtues of civility—humility, integrity, mutual respect—create the possibility of a deliberative democracy. If those virtues sound familiar to Christians, notes Davis, it is because they correspond well to what he has been describing as forbearance. “Because of these connections, I think the modeling of forbearance is perhaps the best gift the church can give to a political culture that is desperate to learn how to navigate its own differences in healthier ways.” Churches that practice forbearance equip their members with the attitudes and practices needed in a healthy democracy. If there is a weakness in Davis’ book it is that he tries to stretch the fabric of forbearance over too many virtues—humility, patience, wisdom, truth, justice—any one of which could fill a book. His method is to show how forbearance connects to and supports each of these Christian virtues. As a result, there is a good deal of repetition. There is also a stylistic turn in his writing that I eventually found grating, and it is that every idea is illustrated three different ways. He does not lack for fluency, however. Every sentence is neatly manicured, with no hangnails or rough edges. These slight discomforts do not detract from the timely value of his insights on civil discourse, both inside and outside the church. If Christians were determined to make forbearance with one another their hallmark, despite their deep differences in social and political agendas, perhaps the prayer of Jesus, “May they all be one, so that the world may know that you have sent me,” could be fulfilled. Barry Casey taught religion, philosophy, and communications for 28 years at Columbia Union College, now Washington Adventist University, and business communication at Stevenson University for 7 years. He continues as adjunct professor in ethics and philosophy at Trinity Washington University, D.C. More of Casey’s writing is available on his blog, Dante’s Woods. Image Credit: Eerdmans Publishing Co.